Star Wars Galaxies... What can I say about this game.. It was an epic masterpiece. 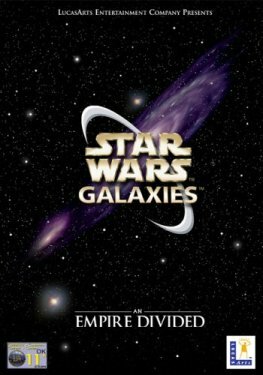 Up until it's young brother came along, and LucasArts pulled the license from Sony on it, to avoid competition for SWTOR... Well, for years there have been projects emulating the earlier era of SWG (known as Pre-CU/Pre-NGE). At last however, a project that I've had my eye on for many a year is shaping up, and actually has a dedicated server to test. I'm running a server, and would like to invite any cKs(whether you wear the tag still or not, rofl) or anyone who's hung with us, you know who you are to join us in testing out this server. You'll need to post a reply on here or PM me (if the PM system is working rofl) to get an account, and the login information. The server is configured to emulate the test center from the old days. This means there is a blue frog to aid you in getting up and running in-game, but you still have to earn most your stuff.. It's a big work in progress, so some things will work better than others, but I'm optomistic about this dev team. The biggest change is that it's no longer one server - We run about 6-8 depending on interest. The new "server" is a server hub. One place you connect to and from there in-game, join our other servers. Some are mini-game servers, some are themed, one of course is the Castle Server (Digland it was called I believe externally to ya'll) and our newest work in progress is Called Game of Camelot (GoC). GoC is going to be a Role-Play server. While we welcome any of you to return (or come for the first time), I was hoping to possibly get some help with this new one. GoC is a RP server (means you talk as your character, etc). But there's a ton of stuff to do on it still before we want to open it to the public. This includes making custom items in-game (altering recipes for some things, making new items, etc), building up couple cities, villages, areas of interest, creating quests and missions, and creating custom mobs (and placing them in-game). You don't need to know how to do this stuff, we can teach ya, or learn together in some cases, rofl. And of course, testers to experiment and test the quests, and customized game mechanics (harvesting/farming system, economy, etc).. If this sounds like anything you'd be up for, fire off a comment on here, and / or point your web browser at digland.enjin.com. (point minecraft at deadcowz.homeip.net no port needed).. We'd love to see ya return once again and see what's the same and different :) As always TS still up and running too.. If no one has told you yet, if you are running Windows 7 or 8, your chance to upgrade to Windows 10 for free is nearly over, and will cost you the traditional Microsoft amount if you pass on this chance. That's right - After July 29th, 2016, one year from 10's release, the free upgrade program is ending. If you haven't upgraded yet, I urge/highly recommend that you at least back your data up and let it install, get it activated, and if you don't want it yet, revert back to your previous OS JUST so you CAN use your key down the road for a Windows 10 install. I have done several for business and personal, and while business ones I backup (and some of the household systems), I haven't had a problem yet with the install, NOR the revert back that I've done on some of them as well... As I say, you may not want it now, but later, it's going to cost you $99-$199+ for something you 'could' have had for free. Once your existing Win7/8 key is activated as a 10 key, it's always good as a 10 key. I missed the payment window by like a day (no joke) and the host after having this server (and account) for 10 years not only suspended the server (okay) but turned around and re-assigned the IP to someone else! (I've been late a few times before, they just suspended the server temporarily, not habitually or anything mind you).. So... The server was never expensive at all, didn't mind paying, but I took the opportunity to save a few bucks and fire up my own ts3 server. Those of you who connect with the PROPER method: TS3.ChristianKeySmashers.com:9113 will notice no change and will connect properly. Those who use the IP will need to switch and put the domain name in there.. That way, if I get tired of running it here and switch back to a hosted service, it will be an invisible seamless experience for you. Monte's step-daughter Mission trip could use your help!